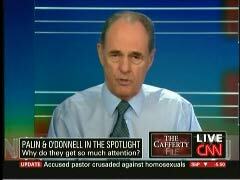 On Wednesday's Situation Room, CNN's Jack Cafferty revisited his anti-Sarah Palin obsession and somewhat predictably, grouped U.S. Senate candidate Christine O'Donnell with the former Alaska governor, stating it "feels like Sarah Palin all over again....O'Donnell has some big question marks on her resume, just like...Palin." Most of the viewer e-mails Cafferty read bashed the two politicians. The commentator devoted his 5 pm Eastern hour commentary to the two Republican women. After his "feels like Sarah Palin all over again" line, Cafferty recounted O'Donnell's emergence on the national political scene, and wasted little time in outlining her negative similarities to Palin: "Suddenly, everybody can't seem to get enough of her. This is despite the fact that O'Donnell has some big question marks on her resume, just like Sarah Palin. She's come under fire for allegedly misusing campaign funds for personal expenses-just like Sarah Palin." CAFFERTY: O'Donnell has also been in the spotlight for saying that years ago, she 'dabbled in witchcraft,' and had one of her first dates with a witch on a satanic altar- she really said that. And she's used her views on abstinence to rule out masturbation. After her last-minute cancellation of two Sunday show appearances this past weekend, O'Donnell suddenly announced that Sarah Palin has advised her now not to do any more national media interviews, and instead, focus just on local media. Based on Sarah Palin's interviews with Katie Couric, that's probably not bad advice. Those were disastrous, remember? I wonder if it means that O'Donnell is as poorly informed on the issues as Sarah Palin was. It all sounds so very familiar, doesn't it? Palin's resume [is] littered with goofy comments like saying that she could see Russia from Alaska, or not being able to name a single newspaper that she read on a daily basis. Sarah Palin quit as governor of Alaska midway through her first term. She often refuses to talk about a lot of the issues with the media, unless, of course, it's with the F-word network- they pay her. But none of that seems to matter. Sarah Palin has become this huge celebrity who is seriously being talked about as a possible presidential contender- which is just what we need. Remember the McCain campaign? Cafferty concluded the segment with his "Question of the Hour" on the two women: "So here's the question: why do people like Sarah Palin and Christine O'Donnell attract so much attention? Go to CNN.com/CaffertyFile, and please enlighten me, because I don't have a clue." Unsurprisingly, only two of the viewer replies which he read just before the top of the 6 pm Eastern hour could be characterized as leaning neutral, with the rest going in full liberal rage mode against the politicians. The CNN personality, along with anchor Wolf Blitzer, also made light of O'Donnell's witchcraft remarks after he concluded reading the replies. If you want to read more on this- got a lot of e-mail- go to my blog, CNN.com/CaffertyFile. CAFFERTY: Have you ever been on a date at a Satanic altar? CAFFERTY: Missed that- me too. (unintelligible) My life has got some voids in it. That's one. BLITZER: That's certainly one I have (unintelligible) (both Blitzer and Cafferty laugh) Jack, thanks very much. The CNN commentator has targeted Sarah Palin since the autumn of 2008, devoting 35% of his Cafferty Files segments over a month period to bashing the former governor. Since then, Cafferty has derided Palin as "lame" and referred to her as "Caribou Barbie." Just over two months ago, he hypothesized that the Republican's popularity was a good omen for Democrats: ""If anything could overcome the increasingly sour view of the Obama presidency, it might be this. Why, the Democrats should be positively euphoric."